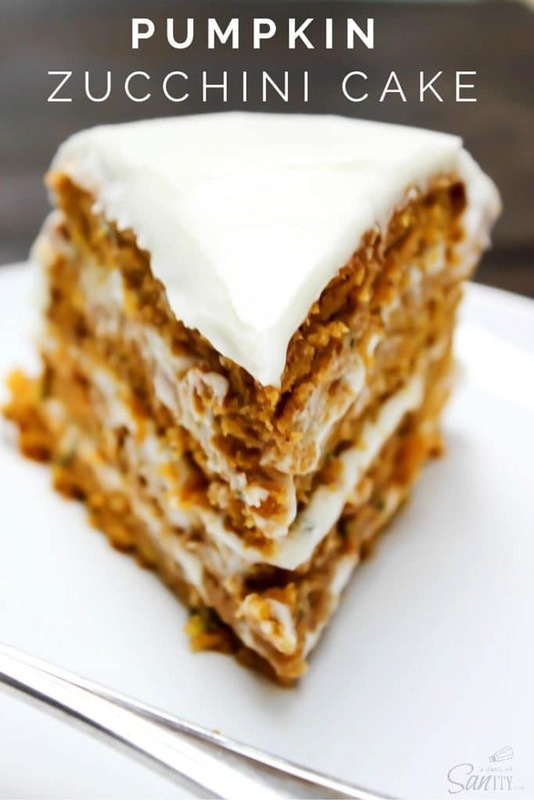 Absolutely dreamy this PUMPKIN ZUCCHINI CAKE is covered in cream cheese frosting, creating the perfect combination for the most delicious cake. This Pumpkin Zucchini Cake is literally my new favorite cake. This coming fall I will be yelling from the Colorado mountaintops to move over Starbucks PSL, I have a new pumpkin favorite. 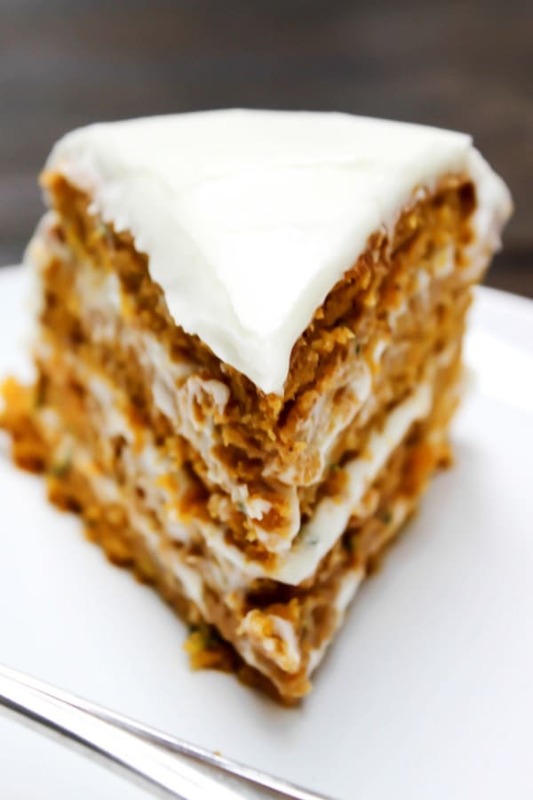 And this Pumpkin Zucchini Cake not only looks like heaven it is truly is mouthwateringly delicious. Pumpkin dreams are more than just turning into carriages for princesses they come in cakes as well. I love cakes! Literally if I could have cake for every meal I would. And this Pumpkin Zucchini Cake is no exception. I tried to only eat one piece, really I did. But I kept finding myself at the cake plate nibbling little bites here and there. Well, maybe not all of the bites were little. But you know what I mean. Then I began to just lick the frosting off the cake plate….I know gross. But it is oh so that good. 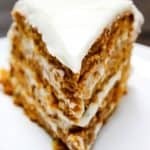 The zucchini and pumpkin combination makes this cake so moist, there is no such thing of a dry crumbly cake when it comes to this Pumpkin Zucchini Cake, so if that is what you are looking for close the page now, this cake is not meant for you. Love the pumpkin zucchini combination? 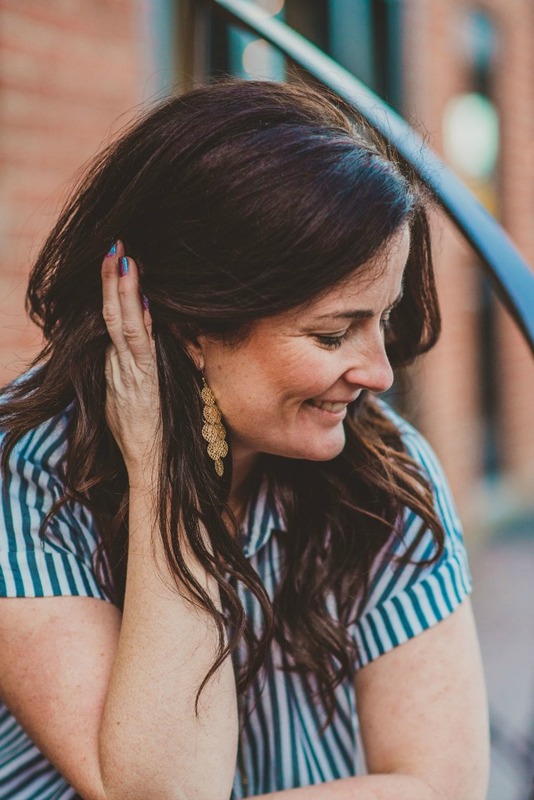 Check out these too: Double Chocolate Pumpkin Zucchini Bread, Pumpkin Zucchini Bread, Chocolate Pumpkin Zucchini Cake and Low Carb Creamy Pumpkin Zucchini Noodles. Want to see how easy this cake is to make? Check out this video with step by step directions. 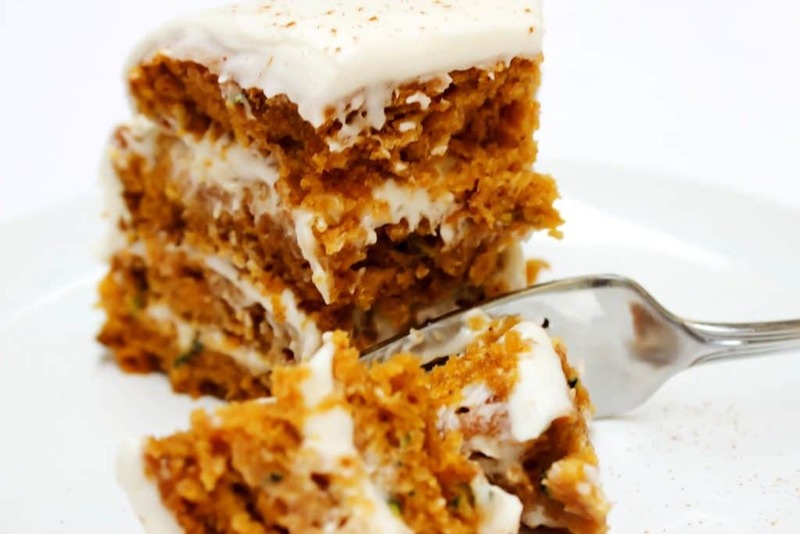 How do you make Pumpkin Zucchini Cake? Combine all ingredients, beat on medium-high until well combined. Add ¾ cup frosting, then add another cake layer. Repeat with remaining cake and frosting. After the last cake layer add the remaining frosting. My favorite kitchen items I used to make this PUMPKIN ZUCCHINI CAKE. 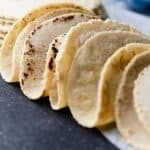 Round Cake Pans – my favorite size to use for a round cake pan is the 9-inch and I prefer dark over light pans. I always have 2 on hand because layered cakes are one of my favorite things to make for dessert. Kitchen Aid Mixer: I love my Kitchenaid mixer and use it almost daily. 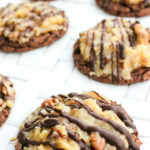 For cookies, bread, sauces, frostings, and dough – I find many recipes that I can use my Kitchen Aid to reduce prep time. I have two that I couldn’t live without. 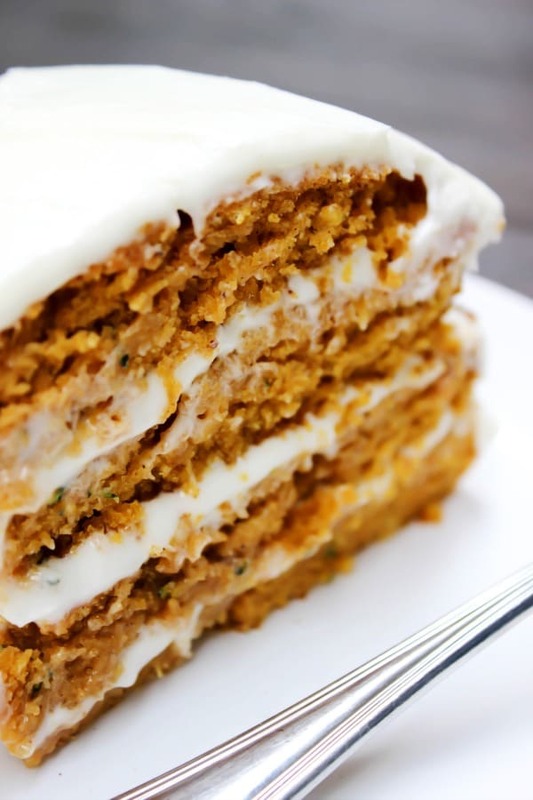 Don’t forget to pin this PUMPKIN ZUCCHINI CAKE to your favorite Pinterest board for later. NOTE to frost the entire cake you will need to double the recipe for the frosting. We typically don't frost the entire cake just between the layers and then the top - for special occasions we do the entire cake. Combine all ingredients in order as listed above, beat on medium-high until well combined. Bake for 20-25 minutes or until toothpick inserted in center comes out clean. If not completely cooked add another 5 minutes until cake is done. Remove from oven and cool on baking rack. Cut each round cake in half. Place one layer on a cake plate or the serving plate you will be using. Add ¾ cup frosting, then add another cake layer. Repeat with remaining cake and frosting. After the last cake layer add the remaining frosting. I just poured mine in the center and then using a knife gently pushed it from the center out and let it run naturally down the sides of the cake. Zucchini Cake adapted by Food.com Total time does not include the time to cool. Wow, that sounds (and looks) great – two of my favorite cakes combined into one! Looks delicious! Do you squeeze excess liquid from grated zucchini? Is this plain flour or self raising flour. Is baking soda…carb soda or baking powder. It drives me nuts when people ask questions like this but… Do you think you could get away with less sugar? I know sugar is important in terms of texture, but it just seems like so much. Would love to sub some out for coconut sugar or even maple syrup, but this cake might already be too moist for that. What strikes a chord when you hear the word cake? For some individuals, the word cake is an equivalent word for longing for, liberality, solace, joy and fulfillment. Has anyone tried reducing or substituting the cup of oil? Sounds so delish! Did you use the pumkin for pie filling or regular pumkin purée? Thank you ! Pumpkin pie filling and puree both come in cans, so please clarify which is used in this recipe. This is pure heaven — love those layers! Can this cake be made a day or two ahead of time? Yes and it will taste just as good. I would store it covered like in a cake plate with lid (suggested but you don’t have too) and store it in the fridge. Do you need to squeeze out all moister from Zucchini like most recipes? 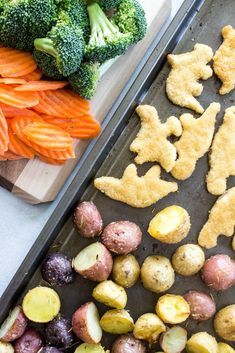 Can this be made in a 9 x 13 pan instead? Have you ever tried baking this in a 13×9 pan? For a casual occasion, I was thinking it would be easier to prepare. Wow one whole cup of oil? Holy Moses, that’s a lot. I’m a little gun-shy to try it. 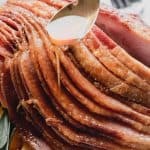 I gotta try this recipe this fall!! Hi, you can do the same here if you would like. I either save the stems for stock or I compost them. This cake has defintely made my must-make list! Hello! 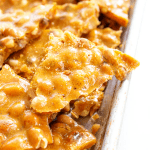 Have you ever made this in a 9×12 pan? 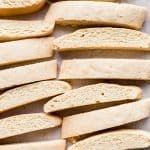 What would you suggest for baking time? Can this be made in a 9×13 pan instead? Man this was an awesome cake!! So moist! 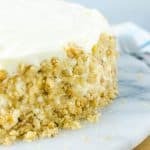 To personalize it to my taste next time im adding some golden raisins to the batter and some chopped toasted walnuts or pecans covered thick on the outer icing. Have you tried freezing it? I am going to be gone in a couple of weeks and get home 2 days before I need this. Do you think it would freeze ok? Would you frost it before freezing? I made this today. It’s sitting here waiting for dinner to be finished. I’m so excited to try it! I reduced the sugar in the frosting and couldn’t stop licking the paddle! Haha. This both sounds and looks absolutely amazing!! Look at all of those layers! I love that you used zucchini in a cake! I love both pumpkin and zucchini! This is such a genius combo! They really work well together! Hope you enjoy it! I love this flavor combo! So perfect for summer! This is the best way to use zucchini in my opinion! I’m so excited for fall! Definitely adding this to my list of things to try! That looks fabulous, craving a slice of it now! 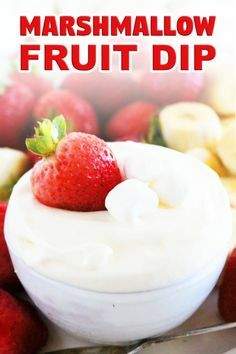 I want to eat this for dessert! OH WOW!! This cakes looks absolutely incredible! Oh my! You have outdone yourself, this looks fantastic and getting me in the mood for fall. Definitely perfect for fall! Thank you! I made this cake. IT IS DELICIOUS! I cut the white sugar in half and only added 1/2 cup of brown sugar. I baked it in a 9×13 and made only half the frosting recipe. AMAZING!! !